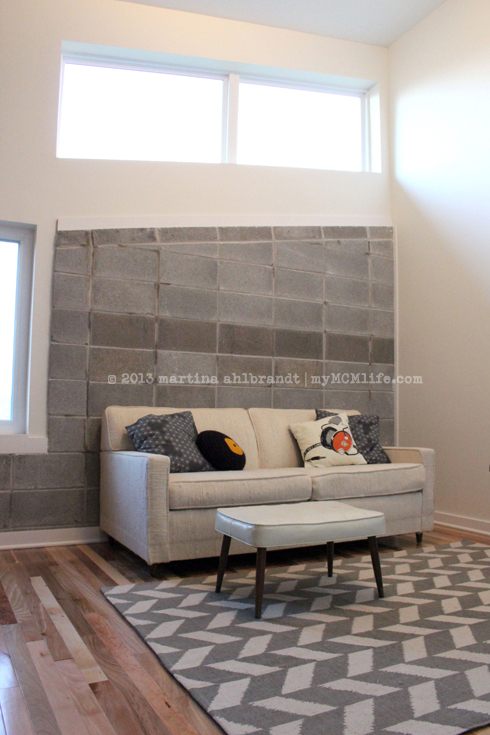 Jason and I had been talking for some time about a bigger shelving unit or built-in shelving in our living room to make better use of the large wall space. 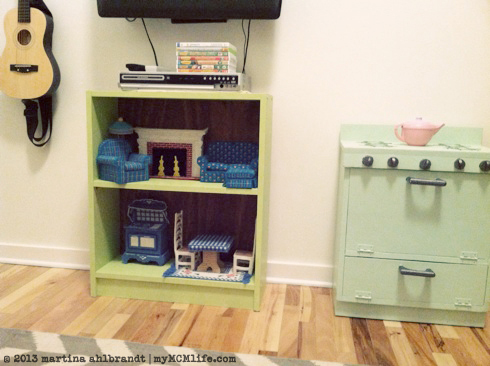 (Tons of ideas on his Shelving Units Pinterest board here.) After looking at a lot of pre-made and vintage options, as well as contacting a subcontractor, Jason ultimately decided to tackle this project himself. In one of my nesting moods, I started emptying everything off of the bookshelf (it’s from IKEA, many years ago, called ENETRI) and made room for it in the den/playroom. I was craving more storage for toys in the play area. I’m really happy with how it turned out. We still need to do some arranging on the living room shelves and we need a boat load of bookends so all our books aren’t stacked horizontally. People often ask us how we keep our living room so clean. 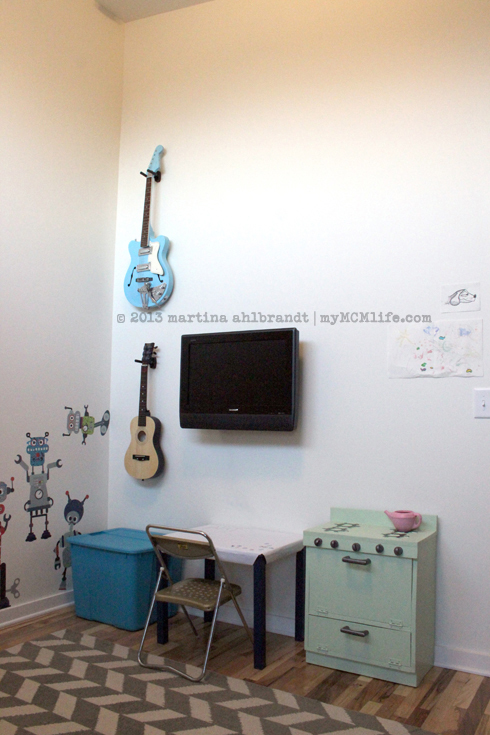 Here’s the answer: the toys all stay in the playroom and in the kids’ rooms. Organization is my jam. Every bin in the playroom has a specific purpose and I purge and rotate toys fairly often. We use the living room for sitting, resting, reading and occasionally watching TV. It’s mostly an adult room. I spend the most time here in the morning for an hour before the kids wake up for my quiet time and during their afternoon naps when I need to put my feet up for a few minutes. 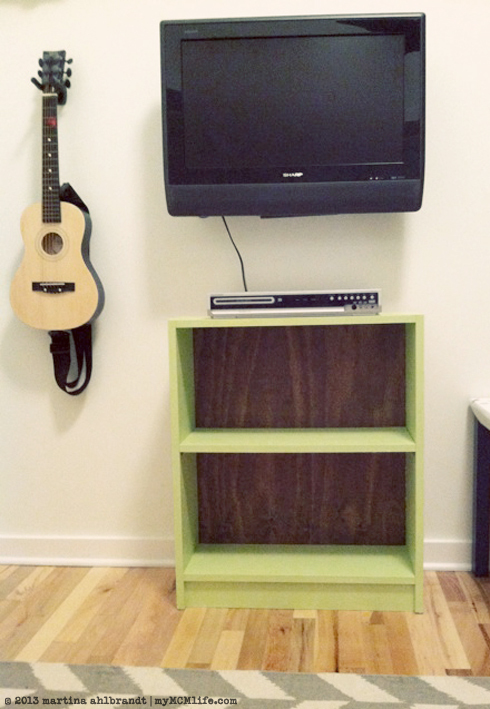 From ugly, cheap bookshelf to cute, cheap bookshelf! 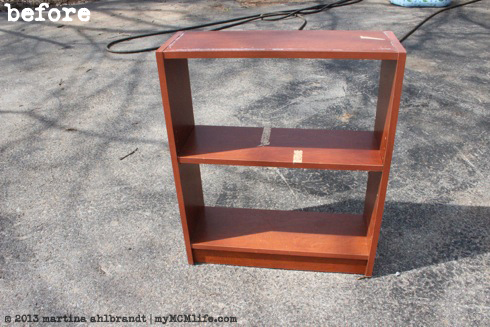 While on the hunt for a dresser for the next kids’ room, I came across this little piece of junk bookshelf. It’s pressboard with a wood patterned laminate and it was dirty and wobbly. BUT… it was only $6.99 and I couldn’t resist! I’m on the lookout for bookshelves for the kids bedrooms, the den, my office…basically, I could use a lot of bookshelves in a lot of places. My dear husband is the perfectionist when it comes to home projects. When I was in elementary school my mom bought me a poster of a kitten covered in paint that said “I’m not messy; I’m creative!” That pretty much sums up the way I do projects, which Jason can surely confirm. He also calls me the Swedish Chef as he’s cleaning up after me in the kitchen. All that to say, I painted the heck out of this thing. I was experimenting as I went. First I tried gray primer spray paint but it ran out. 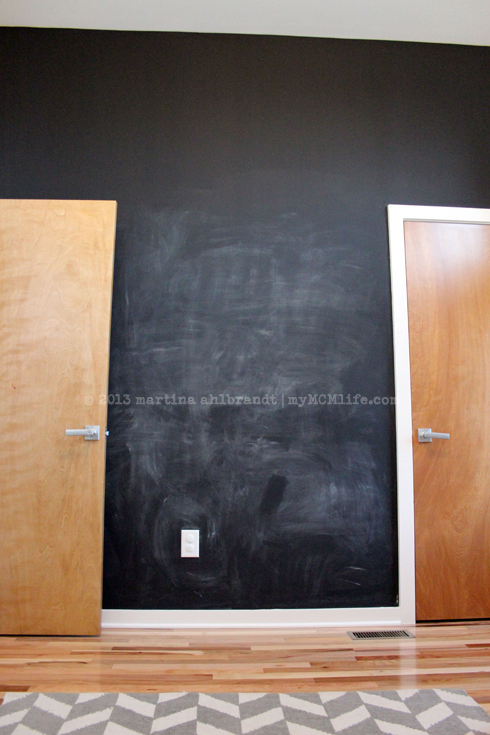 Then I tried flat black spray paint. (I’m a horrible spray painter, by the way.) That ran out too so I changed tactics and went with white ceiling paint for primer because we have a 5-gallon bucket of it in the garage. That worked. Then I painted it with the same quart of Glidden wall paint that I’ve used for the little nightstand dresser in Ali’s room and the recently purchased dresser. I figure maybe one day they’ll all end up in the same room. It took me 3 coats to cover this thing! Even after all my “primer” coats. Before painting, I had added a few screws into the sides to try to stabilize it. They helped but I realized that it originally had a panel on the back, which would have helped the corners stay square. I came up with the idea of adding a piece of stained plywood to the back. We had the stain on hand. I used a rag to rub it onto the face and the edges of the plywood. 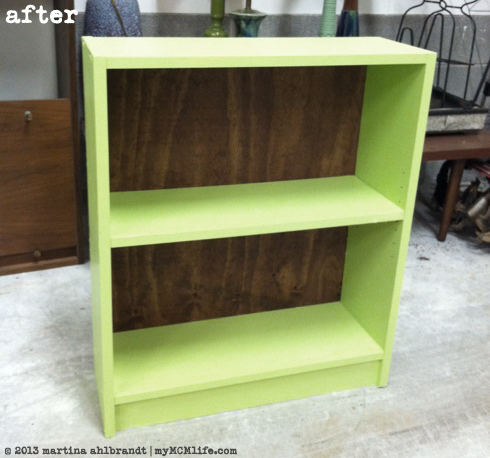 When it was fairly dry (OK, not really…I was impatient…) I tacked it onto the back of the shelves with finishing nails. I really love how it turned out with the Granny Apple green and the American Walnut (color) wood. Oh, and the only thing I had to purchase was the plywood, which was around $10 and I had cut to size (from a 2’x4′ sheet) at the store. So this whole deal cost about $17. For now, it’s residing in the den. 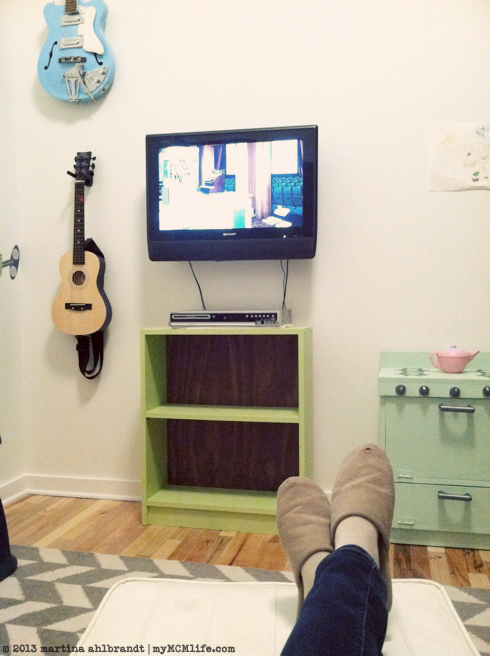 I needed a spot to put the DVD player so this room could start feeling more like a den and less like a playroom. 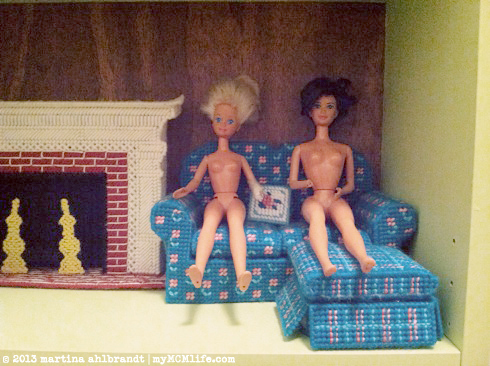 I was also excited to have a spot to set up some of the awesome Barbie furniture my Granny made me. I could only fit about 1/4 of it on the shelf but that’s fine for now. Ali immediately said “House!” when she saw it and she’s pretty excited about these two mutilated “Darbies” from my childhood. The blonde has a broken neck and Ali is quite concerned about her head popping off. 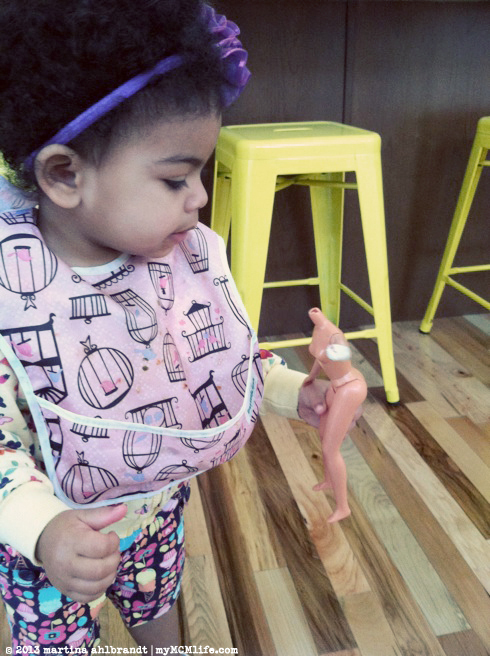 She brings it to me every time and says, “Oh no, Mama!” They’re both naked, missing one limb (from a dog attack) and have butchered haircuts. Based on how rough Ali plays with them, though, I think I’ll wait a year or two before buying her any new Darbies. 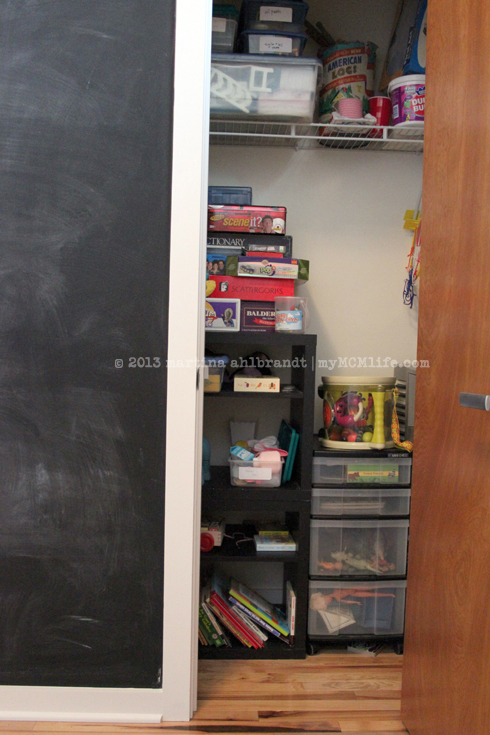 The closet is full of books, toys and games. The sofa is vintage. We’d like to reupholster it someday but it’s not in bad shape and the pull out mattress is in excellent shape. The rug is from Urban Outfitters. I purchased it for a staging project right before we moved in. We had it in the living room for a little while but it was way too small in there. It’s perfect in here. This room is the smallest bedroom in the house but the super high ceilings make if feel big and the high windows and concrete wall make it very unique. I’m hoping a teenager will love it as a bedroom someday. The play stove is second-hand, hand made but someone. I got it at a yard sale. It was Ali’s adoption day gift. Ali’s navy table was a Christmas gift from Grandma and Grandpa. The metal folding chair is vintage from an estate sale in my neighborhood. I got it when I was putting together our first room for future foster kids. The small guitar was a baby shower gift before our first placement. It’s still a bit too complex for Ali but she likes to bang on it, August Rush style. The blue guitar is really special to me. It was the guitar Jason first learned to play guitar on…it deserves it’s own post. The TV is not attached to anything except power. Eventually we plan to get another Roku box for this room (which we use for Hulu and Netflix) and attach a DVD player. We’ll also need some kind of shelving for that. 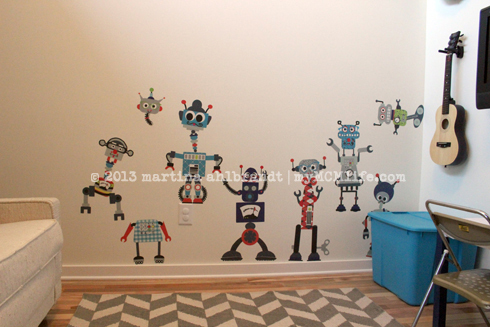 The robot decals I won from a giveaway on Design Mom. Ali loves to give them kisses. FYI, our architect is Ryan Thewes. 4. Basketball hoop. $33 on Amazon. The top priority of this room is fun. 7. Jason’s first guitar, which is now wall art. Second priority of this space is creativity and musical instruments will definitely be part of that. 8. Urban Outfitters zig zag rug, 5×7, in gray. Another big maybe but it’s my current top choice. 9. Pop & Lolli Build-a-Bot decal set. 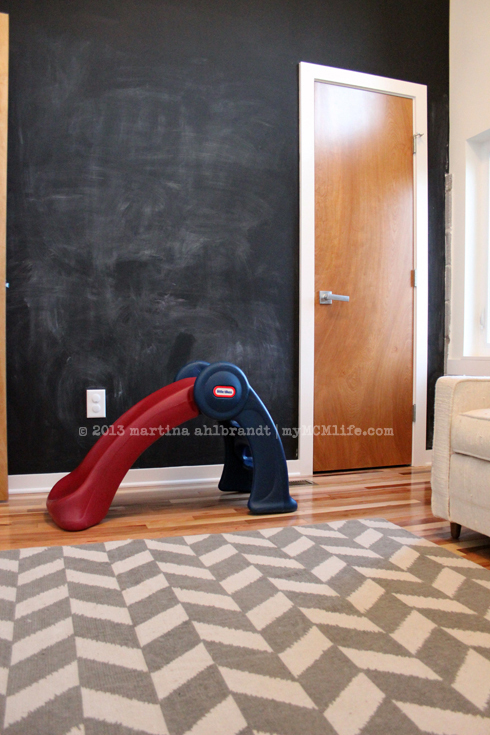 I won these on Design Mom’s blog and I’m pretty stoked to play with them… I mean, let some kids play with them. 11. My old Apple iBook from 2002, which is still kicking, sort of, and hopefully has enough juice left to play some kid’s DVDs. 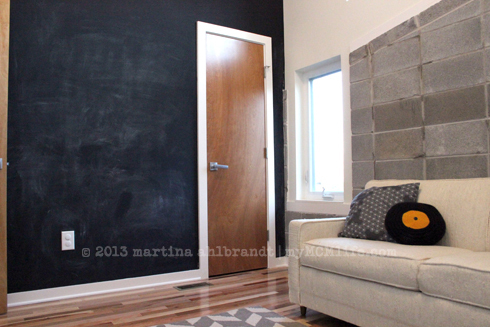 Eventually we might add a small LED TV into this room. 14. 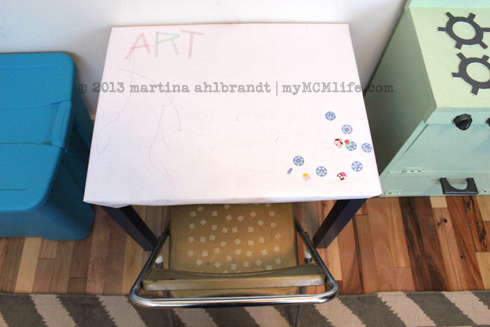 Child-size seating, like this metal folding chair, and maybe eventually a child-size table.